The Savy Shrug is a simple pattern constructed in 1 piece with minimal sewing. Pattern includes sizes XS, S, M, L, XL, 2XL, 3XL, 4XL, and 5XL. Each size has their own written instructions… no parenthesis to try to follow! Pair the Savy Shrug with your favorite cute outfit. Wear over a dress or tank top. Pattern works up quick. Photos are included for guidance. 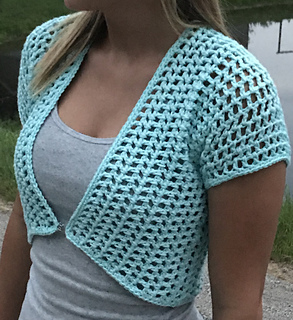 Find more patterns at crochetitcreations.com. Reach out to me at jessica@crochetitcreations.com if you have any questions. I hope you enjoy!